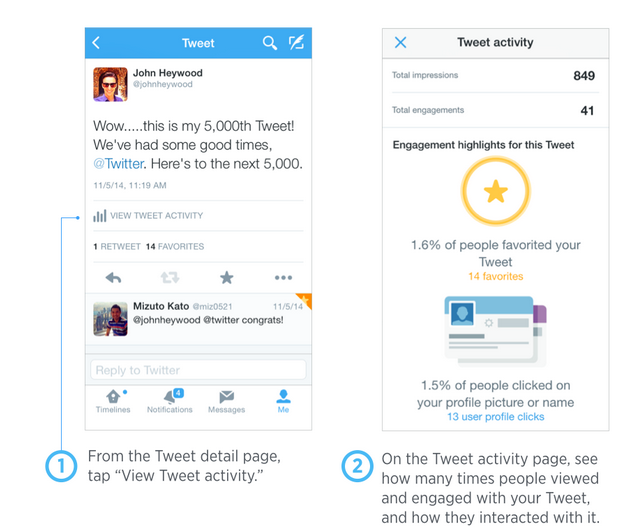 Twitter has once again expanded access to its analytics data, today introducing the ability to view your “tweet activity” on mobile. In the latest version of Twitter’s iOS application, a new feature allows users to tap on a “View Analytics Details” option from any tweet’s detail page in order to see data related to that post, including total impressions, engagements and more. The change is yet another example of Twitter making its analytics data more broadly accessible to its user base, having previously opened up its analytics dashboard to the public earlier this year. The addition of the new iOS feature was initially spotted by The Next Web, which caught a tweet about it from Twitter front end engineer Ian Chan. The company, however, did not bother to announce the feature officially via its company blog or main Twitter account (at least, not at the time of publication). The Twitter Analytics dashboard is a handy resource that tells you how well each of your updates on Twitter’s social network have performed. When the service first launched in July, it was initially targeted at Twitter advertisers and publishers – that is, those who are more likely to be tracking things like impressions, replies and clicks on a regular basis in order to analyze their own social media strategies. The company had already offered advertisers data about tweets they’d paid to promote, but until the analytics dashboard, the same hadn’t been available for “organic” tweets. The following month, Ian Chan announced on Twitter that the analytics dashboard was open to anyone who wanted access. That meant regular users like you or me could log in and see which of our tweets were resonating with Twitter’s audience. On the web, the dashboard shows organic impressions and engagements, charts detailing performance, tweet previews and detailed engagement metrics for each post, and the ability to export your data and permalinks for further analysis. On mobile, by way of the iOS app, the engagement data is provided in a more simplified format. You’ll be shown how many total impressions and engagements a given tweet has received, as well as other relevant stats, such as how many people clicked the link in your tweet, how many people clicked to expand your tweet, how many favorites your tweet received, or how many people clicked on your profile picture or name, for example. While the metrics detailing your total impressions and engagements are shown on each tweet, the highlights shown will vary from tweet to tweet. That is, Twitter will selectively show you the metrics that are relevant to that particular tweet (e.g. clicks, if you’ve included a link in your tweet), but also those that are notable enough for sharing. You cannot see these metrics for retweets from other accounts, which is understandable. The new feature itself is iOS-only for now. Chan said in a subsequent tweet that Android support was in the works, but the company did not have a launch date at this time.